Pressure has continued to build on the Department for Business, Energy and Industrial Energy (BEIS) to reform the feed-in tariff after government statistics revealed August to be the slowest deployment month yet under the new regime. BEIS statistics regarding feed-in tariff deployment, released this morning, showed that across all three bands just 2,782 individual systems were accredited last month. This would make August the worst month in terms of physical installations under the new regime. The previous worst month happened to be the month before - July 2016 – with 3,237 individual installs, meaning that under the new regime the industry has now posted successive ‘worst months’ for installations. The industry does not have much better reading in terms of capacity installed either. Under the residential 0-10kW band, by 20 September the industry had installed just 20.6MW in the current term. A rough extrapolation of that figure would equate to around 23MW being installed in total during T3, ending in two days, leaving more than 75MW of additional capacity carried over into T4. In each of the three feed-in tariff terms, the domestic scale has installed less than half of its allocated capacity, even without taking capacity carried over from previous terms into consideration. BEIS ministers have been repeatedly quizzed over the health of the solar industry under the new regime, particularly during an oral and topical questions session earlier this month. 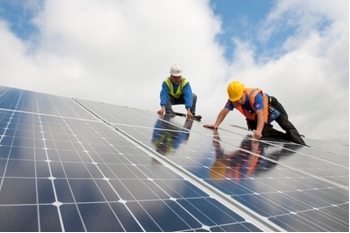 During that session energy secretary Greg Clark claimed that there was “remarkably little sign of confidence dropping” in UK solar, but did say that the department was continuing to monitor the industry’s performance under the new regime. The Renewable Energy Association has pointed out that solar deployment in August 2016 is one third of what is was in 2015. 2/3 Gov't statistics (Energy Trends) show deployment of solar PV in August 2016 is one third of what it was for August 2015. Leonie Greene, head of external affairs at the Solar Trade Association, added that the deployment statistics showed there were “obvious problems” with the scheme that “require urgent attention”. “The really good news is that very little resourcing is needed to get FITs back on track. Furthermore, removing red tape will cost nothing and help to boost the market. The industry is doing all it can to innovate with new business models but government needs to take swift, positive action to support the sector if we are to restore confidence this year,” she added. At the time of publication, BEIS had failed to respond to requests for comment. Meanwhile the statistics also revealed marginal revisions in BEIS’ deployment projections in both Q1 and Q2 2016. Q1 2016 deployment – last month estimated to be 1.155GW – has now been revised to 1.298GW, drawing the figure ever closer to Solar Intelligence’s figure of 1.55GW. But Q2 deployment has actually been revised downwards in the government’s latest statistics, falling from last month’s estimate of 132MW to 113MW, further away from Solar Intelligence’s figure of 223MW.